The Soccer Ball | Essential Equipment for Any Match! There's Rules for the Soccer Ball Too? FIFA is nothing if not thorough and the Laws of the Game specifically outline the size, weight, material, pressure, colour and even shape of the ball. That’s right I said shape. You are not, in fact, allowed to play with that square ball you were given as a gift last year. The law also stipulates what should happen when a ball becomes defective during play. Basically, the match is stopped, the ball replaced, and the game restarted at the last position of the ball. Oh and interestingly, no advertising is allowed on the ball except the FIFA logos, ball manufacturer and other images related to the tournament or league. Soccer balls come in 5 different sizes. The FIFA Laws of the Game state that a match ball must be 14-16 oz however, so in practice this means that only two of the sizes can actually be used in a match. Sizes 1 and 2 are usually only used as collectibles or souvenirs, while the size 4 and 5 balls are more commonly played with. That said, only the size 5 is of sufficient weight to be used officially in a match. Primarily a collectible, souvenir or used for promotions. Usually no more than 17 in (43cm) in circumference. Law 2 simply states that the ball must be made from leather or some other “suitable material”. In practice this means that most balls nowadays are made with either leather, synthetic leather, or a kind of plastic blend called polyurethane. Leather balls are getting rarer as time goes by due to their expense, problems with water absorption, and their tendency to wear faster. Polyurethane balls have become a huge hit in recent years because they are relatively inexpensive, soft, provide a good touch, and resist water much better. 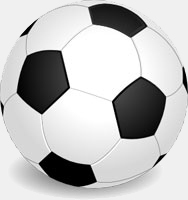 For any official match, the soccer ball needs to weigh between 14 and 16 oz (about 410 to 450 g). For this reason, the only size ball that can be used is the size 5. The inflatable bladder inside of the soccer ball is filled with air to expand the panels and give the ball the spherical shape it needs. The pressure inside of this bladder needs to be between 8.6 and 15.7 psi to ensure the appropriate degree of firmness. After all, deflated balls neither roll nor bounce properly!